Design Data is launching a series of seminars aimed at providing a high-level, non-technical demonstration of the complete BIM process. 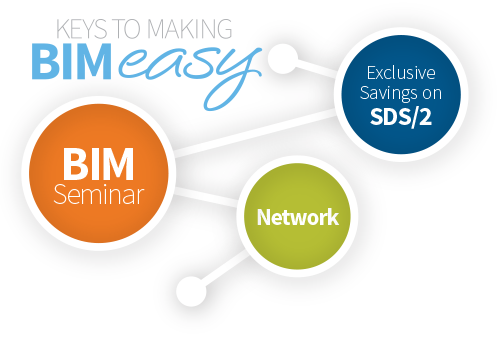 The Keys to Making BIM Easy seminars — which will be presented by Design Data sales staff — will highlight some of the most useful tools and commonly used workflows for today's projects. Seminar attendees will also receive exclusive savings on the purchase of SDS/2 software solutions. Each seminar runs from 2:30 to 5:00 p.m., and is followed by a cocktail hour. The cost to attend the conference is $25 per person. To see the schedule of seminars coming to your area and to register, click here. SDS/2 2015 can import models from DWG and DGN files. Reference Model tools give users the ability to link and update reference models from 3D DWG, DGN, DWF and IFC files. In the New/2 2015: Reference Models webinar, you will learn how to use the Reference Model tools to import and update from 3D model files. The webinar will be on March 3rd from 10:30 a.m. to 11:30 a.m. CST. They're back! For the past 14 years, Design Data has been conducting new release seminars to give users productive insights into new and improved features. Once again, we are hosting live seminars around the country to introduce users to SDS/2 2015. 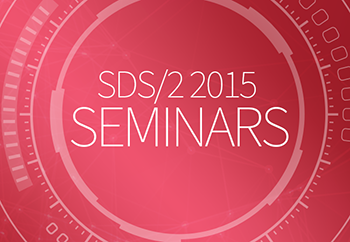 The SDS/2 2015 seminars are open to anyone who wants to learn more about the software. The cost for the one-day seminar is $25 per person for the first five attendees for each company (there is no charge for additional attendees beyond the first five). The seminars take place beginning in April and are scheduled through June. For the complete seminar schedule, click here. At the upcoming NASCC steel conference — to be held March 25-27 in Nashville, Tennessee — several long-time SDS/2 customer will lead sessions to help educate fellow conference attendees. Marc Robitaille from Supermétal will present Working with Large Trusses, which will provide examples of how to select splice locations, set the jig, and rotate, transport, flip and lift trusses. The session will be held on Friday from 1:00 p.m. to 2:30 p.m. and from 4:00 p.m. to 5:30 p.m.
Douglas Steel Fabrication Corp.'s Lawrence Kruth will present two sessions during the conference. The first, titled Stats + Quality = Increased Overall Production, will be held Thursday from 3:00 p.m. to 4:00 p.m. That session will give easy and simple ideas on how to increase overall production. He will also present Demystifying Chapter N and the Building Code — What Every Fabricator and Erector Needs to Know. The session, which will address questions related to Chapter N of the AISC Specification for Structural Steel Buildings, will be on Friday from 1:00 p.m. to 2:30 p.m. The two-part Will Technology Change Our Business Models? session features several SDS/2 customers as speakers, including Brian Cobb (Structural Detailing, LLC), Doug Fitzpatrick (Fitzpatrick Engineering Group) and Mark Holland (Paxton & Vierling Steel). Part 1: Identifying the Challenges will be held Wednesday from 4:30 p.m. to 6:00 p.m. Part 2: Debating the Solutions will be held Thursday from 8:00 a.m. to 9:30 a.m. Both sessions will focus on how fabricators are embracing new technologies. Luis Torres from The Steel Detailers, Inc. will join Brian Cobb in speaking on the State of Technology from 3:00 p.m. to 4:00 p.m. Thursday. This session will provide an overview of the new tools, equipment, software and processes that are available for fabricators today. Fred Tinker of Pacific Drafting, Inc. and David Merrifield of SteelFab Texas are among the speakers at What is the NISD? That session, which will discuss what NISD is and what the organization does, will be presented on Wednesday from 3:15 p.m. to 4:15 p.m.
To see the full advance program, click here.